Birth* Mary Theodosia HAIRSTON was born on 9 February 1837 in Franklin, Virginia. Will In John Henry HAIRSTON's will dated 29 April 1861 in Lowndes County, Mississippi, Mary Theodosia HAIRSTON was named as an heir. [S55] Harden Hairston Family Bible, 1750-1908. The Holy Bible containing The Old & New Testaments: Translated Out of the Original Tongues,.....J. Holbrook's Sterotype Copy., Eighth Edition, Brattleborough, (Vt.), 1817, Library of Virginia, Richmond, Virginia. [S3316] Will of Elizabeth Perkins Hairston - 21 April 1858, Lowndes County, Mississippi, Will Book 1, Page 15., Lowndes County Courthouse,. 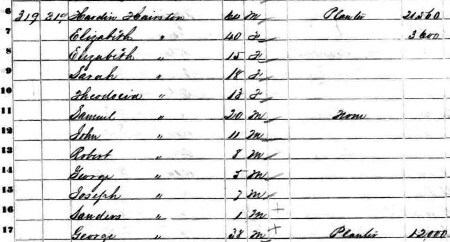 [S271] Will of Hardin Hairston - 29 Sep 1862, Lowndes County Will Book #1, page 122, Lowndes County Courthouse,. 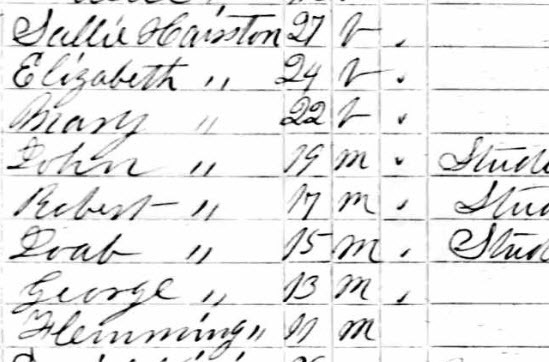 [S1910] 1910 Federal Census - National Archives and Records Administration. [S1920] 1920 Federal Census - National Archives and Records Administration. [S17] Hairston Cemetery, Lowndes County, Mississippi.